Scalability is one of the biggest challenges in an SEO Process. Sometimes this is caused by the size or complexity of the site, business or organization we’re working with or due to the number of projects we need to manage at the same time, at the end we usually end-up looking for support by using SEO tools. Ifttt is a tool that allows you to create tasks to easily automate or integrate the activity from many channels (Web applications and social networks) and share them with others if you want to -with recipes-. There are recipes already created to automatically update your Twitter profile picture when you change it in Facebook or send you an email when a RSS feed contains a keyword or phrase, which can be a Topsy or Quora feed for your brand or competition brand search result, that will help you to monitor those mentions and find link prospects. You just need to be a little bit creative and think about those online publishing and tracking activities that sometimes you don’t do because you don’t have enough time. When I read that trunk.ly was being acquired by Avos my first thought was to better start looking for another service to track and search within my social activity. Sadly Trunk.ly was shut down last March, nonetheless I already had some good substitutes! With Faveous, the most similar app I have found to Trunk.ly, you can add different social sources such as Twitter, Facebook, RSS feed, YouTube, Delicious, LinkedIn, etc. to your profile feed and easily browse and search through the links you’ve shared -in tweets and posts-, filtering by content format or network. Faveous also allows you to share content with a bookmarklet or iphone app and browse or search within the public profiles of other users or even subscribe to their profile’s RSS feed. If you want to track and search within more private content, such as Gmail, Google talk or Calendar you can use CloudMagic or Greplin that also offers the integration with Salesforce, Yammer, Basecamp, Google docs and Evernote. Both of them are fantastic to quickly search documents across many tools or services from your mobile phone thanks to their apps. Manage your emails more efficiently and easily identify and connect with people that message you by extending Gmail functionalities with Chrome and Firefox plugins such as Boomerang (email reminder and scheduling), Rapportive (senders profiles in social networks, location, recent emails and notes) and Streak (CRM, mail labeling, filtering, scheduling). These features can be really useful for link prospecting, to effectively identifying, managing and following-up with contacts. You can also take a look at this post about Gmail productivity for link builders by John Doherty with ideas and tips for this. You cannot manage or improve what you don’t measure. As an SEO you leverage more and more social related activities, among other things, to give search engines more authority signals to your content. Do you know which are your most popular tweets? 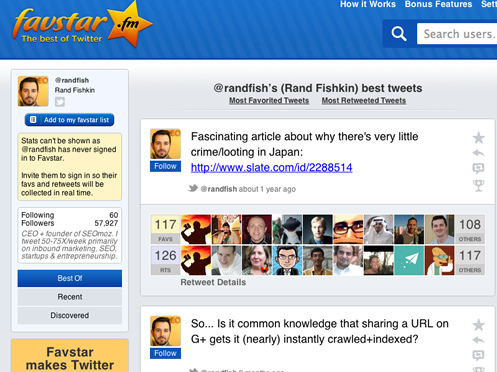 And your competitor’s most favorited or retweeted tweets? Or your industry’s leaders? It can help you to identify opportunities and ideas! There are literally hundreds of social media monitoring tools out there and it can be a real challenge to identify that simple, easy to use, reliable tool that provide you the most relevant data you need to make decisions. Another really useful tool to track and analyze your (or your competitor’s) twitter activity is SocialBro, that provides you with very interesting information, such as who doesn’t follow you back, famous, active, inactive and influential followers, the location of your followers, best times to tweet, etc. All this through a very comprehensive dashboard. A huge challenge when you use so many tools to track your online activity is the amount of time you spend with each one of them. A solution for this is the use of an integral online business activity dashboard, like the one you can easily create with Cyfe. Having a single access to all or most of the Web data you’re interested on tracking in real time will save you a lot of time. Other similar dashboard tools you may also like to try are Geckoboard or Ducksboard. What can you do to never forget and easily organize those “quick” requests you receive from your colleagues sometimes when you’re having a coffee and don’t have your computer nearby? I don’t mean to organize your team’s work or activities –you surely follow a plan to develop your SEO process with specific goals and KPIs and you use tools like RedMine or BaseCamp to effectively manage it as a project-, but I mean with your own time. I personally didn’t think before I would need a time management tool to help me be more effective with my daily activities but sometime ago my moleskine and Outlook calendar were not just enough anymore. Since I really like easy to set, intuitive solutions I started with the simplest but definitely one of the best -and I’m not going to tell you anything new here-: Google Calendar, which was really great to organize my day-to-day activities (and share them with other members of my team). The problem was the lack of ability to easily check and add new activities when I was on my mobile -or with my iPad- and for that the best app I’ve found so far is GoCal that will also send you alerts -those that you definitely will not miss- and let you geolocalize your events to get to your next appointment on time. With Google Calendar + GoCal it was so much easier for me to organize, control and prioritize my time. Another productivity challenge is to keep focused and really getting things done, especially if you’re constantly distracted by incoming messages, emails, tweets, phone calls and your colleague’s never-ending SEO questions. The answer is Pomodoro, a time management technique in which you have to select one task to do at a time and spend 25 minutes with it until a timer rings and you can take a short, 5 minutes break. After completing 4 iterations of pomodoros you can take a longer 15-20 minutes break. 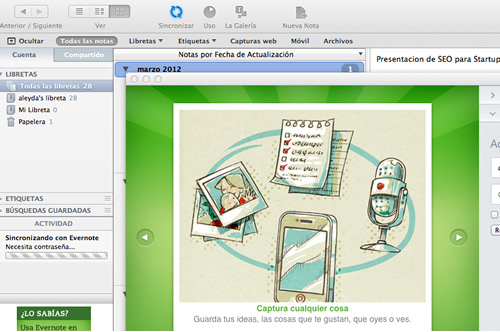 Finally, a tool to help you keep your notes an ideas organized: Evernote. I take a lot of notes. I need to take them to not forget things -I don’t have a photographic memory-, and I really like to write things down and even make drawings to remember them. Before I used my Moleskine, Laptop or Mobile and I needed to get back to my computer to write them all down and organize them. Now with Evernote I take notes, pictures and even record audio with my iPhone, iPad, Laptop or Desktop computer… and sync them all in my account that I can easily access through the apps they have built for all the devices I use or the Web if I want to. So… What are you waiting to start doing the same? You will surely save a lot of time! If you like to make the most out of (SEO) Tools to improve your productivity you cannot miss this year SMX London where I will be speaking in the SEO & Social Media Power Tools session and I look to share much more like this. I look forward to see you there! 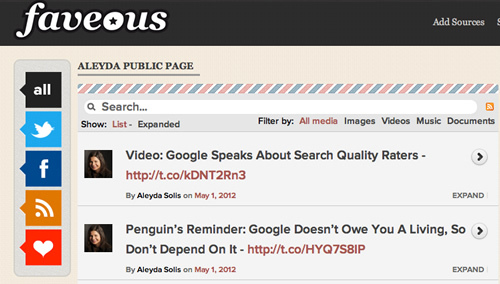 I’m also curious: What non-SEO tools do you use to make your SEO life more productive?